Even doing just one pull-up is an impressive and noticeable feat of strength. It requires a high level of back, shoulder, and bicep strength to pull off, but once you’ve done one, it’s easier to do more. 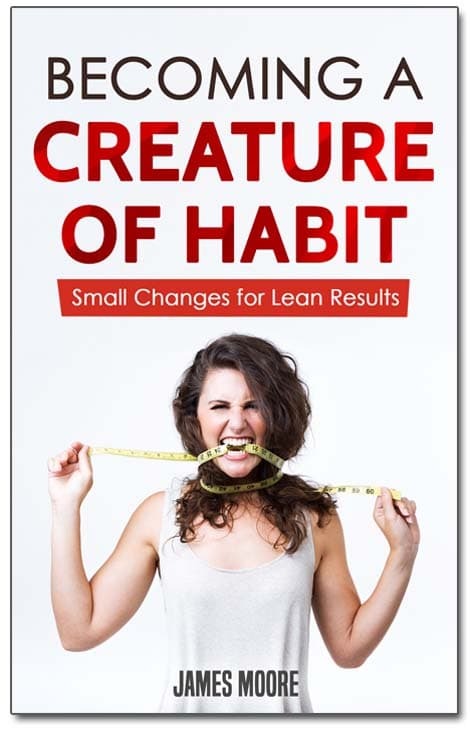 We can easily create mental barriers that stop us from properly progressing. Just the thought of doing a pull-up can make people think they’re not strong enough, even when they are. The 17 pull-up variations below can help you develop the mental and physical strength to finally complete your first rep or take your pull-up game to the next level. If you struggle to do a single repetition, try a negative pull-up. Your muscles are stronger in the eccentric portion of the lift i.e. when they’re placed under stress as they lengthen. So, when you’re lowering the weight in a movement, you’re stronger than when you’re lifting it up. Negative pull-ups mean that you just train the lowering portion of the lift by jumping up or stepping onto a surface to lift you up high enough. The reason they’re so good is that they develop your strength as well as helping you ease into the groove of the movement. Once you develop enough strength, you can start to use your natural stretch reflex to “bounce” yourself up from the bottom. After negatives, kipping pull-ups are the next best movement for training the pull-up as they allow you to gain momentum and use your legs to kick you up. Once you’ve mastered negatives but don’t quite have the strength to pull your body all the way up, kipping is the next best option. Alternatively, you might be able to do a few pull-ups but want to increase your volume. Neutral grip chin ups are the position where your body is the strongest to pull itself up as it can maximally recruit the back and biceps. 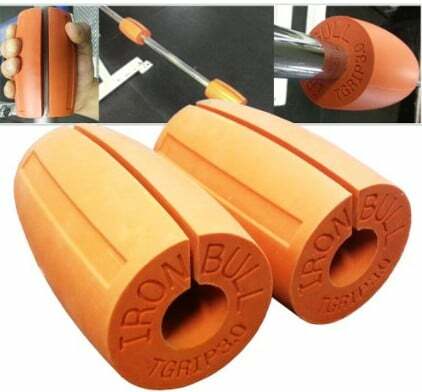 These are fantastic for developing strength across your entire upper body which will translate over to your standard pull-up. Neutral grip pull-ups tend to be the most comfortable position for most, too. Underhand grip is a step up from the neutral grip which is a great way to really build the biceps alongside your back. 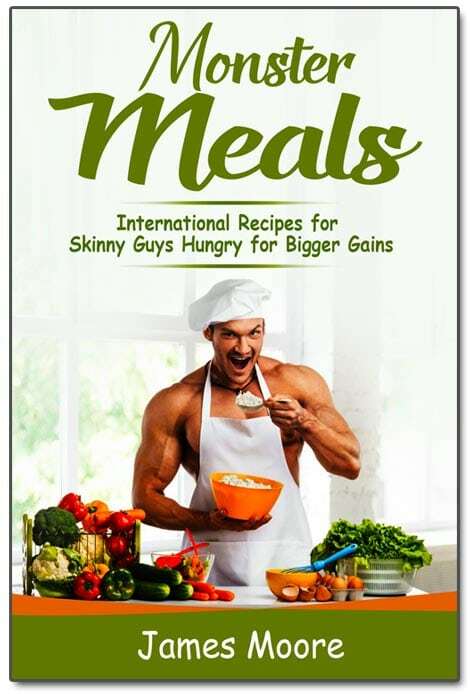 This can both save you time with your workouts and ensure that you make the maximal amount of gains. These are a great way to start building yourself up to a one-handed pull-up. To complete archers, all you have to do is pull yourself up towards one side with each pull. Try to get your chin as close to your hand as possible. Tarzan pull-ups are like neutral grip pull-ups taken to the extreme. However, you may need a full straight bar opposed to a standard pull-up bar to do them. Standing underneath the bar, interlace each set of fingers around it before pulling up your whole body so that your right shoulder touches the bar. On the next rep, do the exact same but make it so that your left shoulder touches the bar. L-sits are a gymnastic move specifically designed to target work the abdominal muscles as much as possible. Combining them with the pull-up makes for a full body workout in one simple move. Grab the bar with an overhand, neutral or underhand grip. Lift your legs off the floor and extend them as far out in front of you as possible so that your torso and legs make an L shape. Hold them in this position as you complete a standard pull-up. If you can’t fully extend your legs out, you can also do these reps with your legs bent. 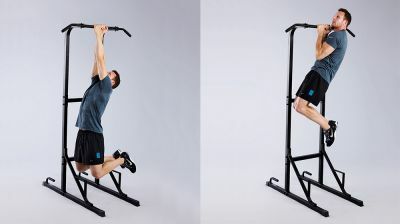 If you want to add a little flare and finesse to your workouts, then the walking pull-up is a great movement to master. It simply involves a standard pull-up, but instead of just pulling yourself up to the bar you move your legs as if you were walking up steps, like a ladder. This makes the movement longer and harder as you have to pause with each “step”. Not to mention, it looks extremely impressive and is a great way to show off your upper body strength to anyone you want. If normal pull-ups are too easy, then it’s time to kick it up a notch. You can attach weight in a number of ways: plates, kettlebells, dumbbells or even just objects lying around the house if you exercise at home. All you need is a sturdy weight belt to hang the weight from your hip and you’re good to go. If you want to improve your shoulder and back health, then you can even just attach weight and hang from a bar. This also doubles as a fantastic way to train the grip. Alongside archer pull-ups, these are great ways to train for the one-handed pull-up. They’re also a fun way to spice up your training and make it more interesting if you’re a little bored with doing the same movement over and over again. Start with a normal archer pull-up by bringing yourself up to one side and then, in an arch shape, pull yourself over to your other hand before returning to the bottom of the position. Complete an equal amount of reps in equal directions. Following on from around the worlds, typewriters keep you in the topmost part of the movement which really challenges your lats and biceps. Pull yourself up towards one hand and then slide yourself horizontally to the other hand and go back and forth until you’re worn out. A big reason that people fail with various movements is that their grip isn’t strong enough to hold onto the weight. Towel grip pull-ups help to increase the tension placed upon your forearm muscles which will help to increase the amount of weight you can lift on other movements. Also, studies have shown that increased grip strength is linked to increased longevity. All you need to do is loop a couple of towels over the bars and hold onto them with each hand. You might be surprised how much more challenging it is. Fat grips are similar to towels in that they challenge the grip. However, they’re more similar to the standard pull-up movement as you can just clip them around the bars. However, most people have towels lying around the house whereas you have to purchase fat grips in order to use them. If you’re already a pull-up master, then the single arm pull-up is an incredible display of strength that barely anyone can do. The best way to train for a one-arm pull-up is through archer pull-ups, typewriters and weighted chin ups. If you can do a pull-up with your bodyweight attached in plates around your waist, then you have enough strength to complete a one-arm pull-up. Row pull-ups target the back. They engage more of the traps, rhomboids, lats and rear delts as your torso is parallel to the ground. This also makes the movement a lot harder to complete, and also recruits a high amount of the abdominal muscles, too. For row pull-ups, start with your hands gripping the bar and then bring your torso up in front of you as if you were going to do a front lever, then row yourself up to the bar. The further you extend your legs out, the harder the movement becomes. Not everyone completes pull-ups to the full range of motion which leaves a lot of gains on the table. Fully extending your body means that the lats and biceps have to work even harder to pull you to the bar, making the pull-up harder but giving you more bang for your buck. 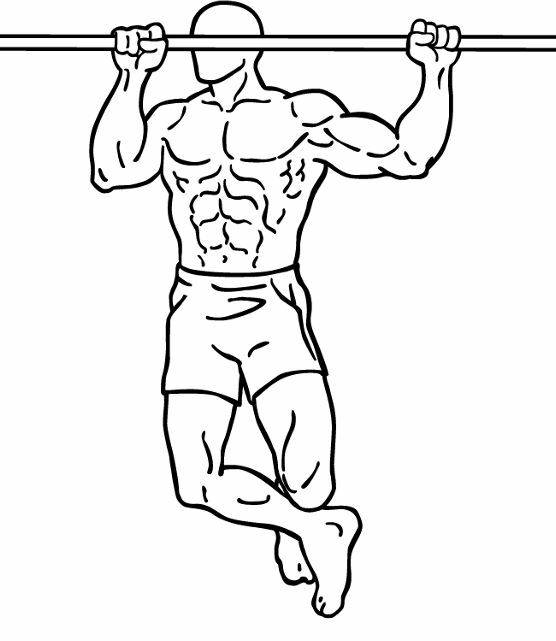 Dead-hang pull-ups simply involve taking a short pause between each repetition to hang from the bar. Alongside the single arm pull-up, a muscle-up is also a great way to show that you’re proficient in the art of the pull-up. One of the best ways to get there is to train with plyometric pull-ups. Essentially, you just need to pull your body up fast enough so that your hands can leave the bar for a split second. If you’re powerful enough, aim to try and clap your hands between each rep. After a while, you’ll be able to pull yourself up and throw your body of the bar into a dip position to lift yourself up, completing your first muscle-up. 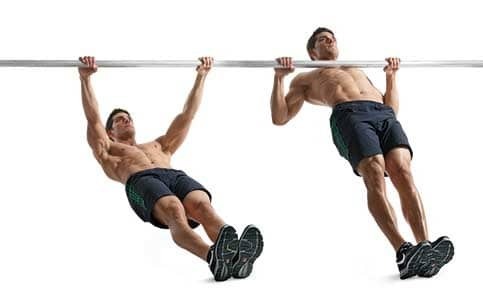 The pull-up is a fantastic bodyweight exercise for building up the back, shoulders, arms and abdominal muscles that can be done almost anywhere. All you need is a bar and you’re good to go. Getting familiar with these 17 variations is a great way to take your pull-up training to the next level. It just goes to show that you don’t need access to a host of fancy equipment just to get in a good workout. Mastering the bodyweight basics first can make all the difference whilst still providing challenging and enjoyable exercises. If you’re looking to build a big and powerful back, then the pull-up is a must, no matter which technique you end up using. Full vs Partial Range of Motion: Which Works Better for Getting Bulky? Can push ups replace the bench press for building a powerful chest?